I recommend that you leave the frothy page-turner at home when you do your summer reading. 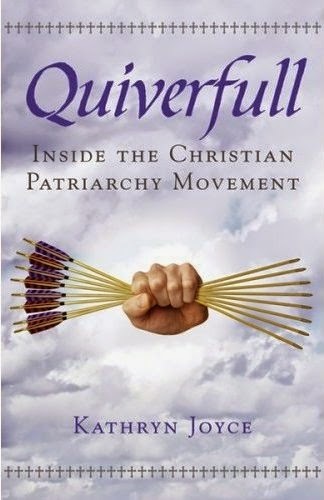 Instead, read Quiverfull by Kathryn Joyce--every single word of every single page, with my comments about Joyce’s antinatalist bias in mind, as though your reproductive freedom depends upon it, because it may. Joyce (a contributing writer for Nation Magazine) does an excellent job of reporting the self-labeled Christian Patriarchy Movement, a counter-culture which lives the values of sixteenth-century Calvinism, where the father is the spiritual and earthly leader of the family. Through her interviews and participant observation, Joyce found that Quiverfull families model themselves on the white settler families of pre-Revolutionary English colonies in North America whose economy was based on forcibly exploiting the natural resources of the indigenous people, the slave trade and slave labor. You will get a glimpse of how women in this movement see the shortcomings of our feminist movement, and you may be uncomfortable with how well the shoe fits. Hopefully, rather than dismissing these womens’ criticisms, you’ll ask whether our feminist movement has stayed true to its goals of liberating ourselves, and if present-day mores have improved women’s lives or created a more equal society. Chapters 15, 16 and 17, “The Natural Family”, “Return to Patriarchy” and “Godly Seeds” digs a little deeper into history and politics, presenting an excellent review of nationalists’ and nativists’ use of social policy to advance national interests through tax policies favoring large families, and their use of strategies, such as homeschooling, home businesses and home-based churches to spread the ideology and the theology of patriarchy. Denying racism, the Christian Patriarchy Movement, seeks to “be fruitful and multiply” to increase white Christians, but at the same time accepts converts to Christianity and recommends that white Christians adopt children of color. Studying these chapters provides the basis to understand Chapter 18, “Demographic Winter”, the blockbuster centerpiece of Joyce’s book. The various strands of history, politics, and religion are pulled together to showcase the Christian Patriarchy Movement’s vision of the death of Western Civilization unless the United States and Europe start producing enough babies to the replace the old and dying. And, they have the cold, hard demographic facts to back them up. It’s being called, “the baby bust,” “the birth dearth”, “the graying of the continent”. Joyce attributes this to a “race panic” as low fertility among white couples coincides with an increasingly visible immigrant population across Europe. So, Joyce has done a brilliant job of observing, describing, quoting and analyzing the pro-natalist underpinning of the Christian Patriarchy Movement, and she has educated her readers about all the dry-as-dust pronatalist tax policies and the demographic realities internationally. We will be wise to understand the gravity of her message; pronatalists are determined to encourage the Western world to make more babies, therefore they respect women’s reproductive rights only as long as those rights are to have as many babies as possible. BUT, we feminists will never start to effectively fight this battle to control our own sexuality and reproduction if we forget that there are two sides to this battle. It is not the right-wing versus the feminist and their liberal friends. It is the right-wing pronatalists versus the wealthy and influential anti-natalists. These are the families, such as Bill and Melinda Gates, the Rockefellers and Warren Buffet, and other capitalist friends who have no more regard for a woman’s freedom to control her body, than the right-wing, pronatalist Koch Brothers, et al. They just favor a different way of solving social problems, such as global warming and poverty. They believe that these problems are caused by too many people. They don’t put their efforts toward changing consumption patterns, having a more equitable distribution of the wealth and allowing the occupants of the land, rather than corporations, to use resources to benefit their own people. They are doing everything possible to discourage women from reproducing. They’re against “teen pregnancy”. They’re for any social trend that reduces women’s fertility: gay and transgender lifestyles, women going to college and having careers, later marriage, and the use of contraception such as the Pill, abortion, and sterilization. (The Christian patriarchal right opposes each of these social trends). There is a anti-natalist equivalent policy to those pronatalist policy listed in the book. And, for every bombastic quote of a pro-natalist leader, such as Yasir Arafat’s “the womb of the Arab woman is my best weapon” can be matched with a quote from an antinatalist, such as Paul Ehrlich, who wrote the “Population Bomb”. I hope I’ve encouraged people to read the book. It’s time that feminists who oppose policies that control women’s reproduction, whether it be employed by the pronatalists or the antinatalists start developing our own strategies, independent of the anti-natalist-controlled “pro-choice” movement.